Are you a gamer in search of the best gaming headset to complete your gaming setup? Whether you’re steaming your games, coordinating with your teammates or immersing yourself in a virtual world, having the right gaming headset for your playstyle is essential. There are plenty of gaming headsets on the market, but this guide will help you find one that fits your needs for a price range, comfort, quality and durability. You don’t have to break the bank for a gaming headset, but it’s important to balance cost with long-term reliability and functionality. Read on to learn about the features and qualities to look out for when choosing the right gaming headset for you. Whether you play on PC, Xbox One, PS4 or some other gaming device, it’s important to make sure that your gaming headset is compatible with your chosen platform. Fortunately, almost all headsets come with a 3.5mm jack to accommodate a wide variety of platforms. However, in some cases (such as with older Xbox controllers), you may require an adapter to use your headset. Most wireless headsets can work with all platforms using the optical audio cable input found on the back of many PCs and consoles. Some headsets may only come with a USB input, which may limit which platforms you can use the headset on. If you own more than one platform, remember to always check the product descriptions or reviews to make sure the headset is compatible. It’s also a good idea to see if you need to buy any additional cables to ensure the headset works for your specific setup. Wireless. If you love convenience, maneuverability and simplicity when it comes to your devices, you may prefer a wireless gaming headset. 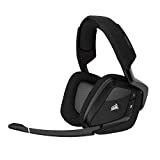 If you want to go wireless, look for low-latency gaming headsets that can be used at a reasonable distance without connection lag. With wireless headsets, you may experience interference; make sure you look for lag-free wireless headsets with a long range and good battery life. Wired. Wired headsets are able to maintain a strong, consistent connection, which can be the perfect fit for gamers who stream their games or need to maintain constant communication with teammates. You also don’t have to worry about interference or possible lag between your game and what you hear. The downside to wired headsets is that you have to deal with more cables, which may or may not be a problem for you. If you play games online with other people or you stream your games to an audience, your gaming headset needs to have a crystal clear microphone that’s easily accessible. For some, microphone quality may not be as important as audio performance, noise isolation and comfort. 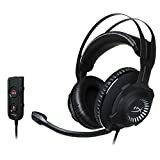 However, if you’re someone who frequently uses a microphone for gaming, you’ll need to look for higher-end gaming headsets with a flexible and realistic-sounding microphone. There are two main types of microphones used in headsets: omnidirectional and unidirectional. Omnidirectional. These types of headphones can pick up your voice easily, along with background noises. This can be very bad for gaming because it can pick up noises from all directions. Unidirectional. This only picks up sound from the direction the microphone is facing. This means that most other noises are blocked, aside from what you speak into the microphone. The only disadvantage is that unidirectional microphones can sometimes pick up breathing if they’re too sensitive. There are two types of headset styles to choose from based on your lifestyle and personal preference: open or closed. Open. Open gaming headsets are designed to allow enough sound through the headphones that you can still remain aware of the environment around you while also enjoying the audio of your games. Open gaming headsets work best for people with busy lifestyles who may need to be alert to their surroundings more often. Closed. Closed gaming headsets are made for complete noise isolation so you can enjoy music and games without outside noise interference. Not only can you not hear outside noises, but people around you cannot hear what you are listening to through your headset. 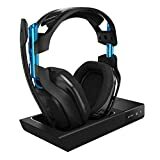 When searching for the best gaming headset, you want something that will keep you comfortable even after hours of gaming. Not only should the headset have comfortable and breathable ear cushions, but it should also prevent sweat or discomfort after an extended amount of use. Look for headsets with mesh or memory foam ear cushions. Some people prefer the texture of leather on the cups and some prefer felt fabric. The advantage of felt is that it rarely makes your ears sweaty, whereas leather can be less abrasive. It’s also important to pay attention to the adjustability of the headset. It may look and perform exactly how you want, but if it doesn’t fit you, you’re out of luck. Choose a headset that has an adjustable headband and interchangeable ear cups. You should also be on the lookout for glasses-friendly headsets if you typically wear glasses while gaming. Don’t let comfort be an afterthought – it will make all the difference in how much you enjoy your new headset! 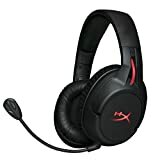 Sound quality is one of the primary features to consider when searching for the best gaming headset that will take you right into the world of your games. For the best realistic audio experience, look for gaming headsets with audio that gives you balanced audio accuracy with large speakers (around 50mm or more). Many of the best gaming headsets come with surround sound. Surround sound can play a significant role for gamers who play shooter games; with surround sound, you can more easily hear specific sounds within the game, such as footsteps coming from behind. This will give you a big advantage over your enemies and help prevent them from sneaking up on you. Of course, having a surround sound headset isn’t necessary, but it can be a nice extra if you want more immersive audio. The difference between headsets that provide stereo audio and surround sound audio is that surround sound can help with positional accuracy but at the cost of sound quality. Stereo audio, however, plays one side of the headset at a lower volume than the other to help you differentiate which side the sound is coming from. The one you choose should be based on your personal preference and your budget (stereo headsets are generally cheaper). If you plan on investing in a premium gaming headset, it needs to be able to hold up for years of usage. If you want the longest-lasting and most durable gaming headset, look for headsets with headbands that have been reinforced with steel or metal. The best gaming headsets will also have braided or reinforced cables to ensure they last as long as possible. Additionally, you should consider the overall construction of the headset, particularly the connection between the headband and the cup of the headset. This is the part that gets the most strain, so choose a sturdy headset that balances durability without adding too much weight. The HyperX Cloud Alpha headphones are equipped with custom 5mm dual chamber drivers to reduce the distortion to a minimum and provide an immersive, clear, and powerful sound. The drivers help separate the bass from the mids and high notes, thus making the sound spacious. As a result, you’ll be able to hear your enemies’ steps and know their location before even seeing them! 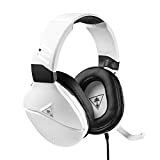 Furthermore, the headset is comfortable to wear for long gaming sessions, due to the durable aluminum frame and padded memory foam earcups and headband. Since the cable is the element that tends to break first, the headphones are designed with a braided cable that can be detached and easily replaces. Finally, the detachable noise-cancellation microphone is perfect for communicating with your team. The Cloud Alpha works with the majority of available platforms (PCs, consoles, and more) and is equipped with in-line controls for easy access. Sennheiser boasts over the fact that their GAME ONE model is perfectly created for gamers and people who have to (or like to) wear headphones for prolonged periods of time. One can see they have a good reason for such boasting once they test the XXL velvety earpads that let airflow ventilate the ears combined with the open-back design and the generously padded headband. Furthermore, GAME ONE is equipped with Sennheiser transducer technology optimized for professional gaming. This means the sound is delivered in a way that’s relevant for gaming environments, where the special orientation and the separation of back noises are very important. Since communication is important in most MMORPGs or FPS games, GAME ONE has a noise-canceling microphone that can be muted just by lifting it in upright position. Also, the volume control is placed on the right ear cup, for easy access. 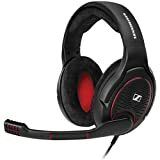 Finally, the Sennheiser GAME ONE is designed to be durable and easy to use with most platforms. The frame is sturdy and the earpads can be changed. Furthermore, the braided cable can be replaced to fit any platform you need (PC, consoles, Apple products, and so on). Logitech is well-known in the gaming accessories industry, so it’s no wonder why their G533 headphones were created with pro gamers in mind. First, they made sure the sound gives away the position of your enemies without a shadow of a doubt (what audio techies will call positional sound). For this, they fitted the headphones with their new Pro G drivers and DTS Headphone: X 7.1 Surround Sound system. Furthermore, these are wireless headphones! They connect with your PC (designed for Windows 7 and up and Mac OS) on 15 meters (about 50 feet) range and you won’t suffer from any delays, which tend to happen with wireless products. The controls are placed on the earcup, and the included adjustable boom microphone can be easily muted. Finally, the design is incredibly comfortable and lightweight, so you can wear them for hours. The battery will hold for up to 15 hours of continuous fun and it can be replaced. In today’s digital world, the sound is one of the most important layers of gaming. It not only adds an extra dimension to the virtual worlds we love to explore, but it also offers additional auditory information, beyond what the eye can see. But in order to let sound guide you in virtual adventures, you’ll need a reliable heatset that can deliver accurate and high-definition audio quality. And this is where the Razer Thresher Ultimate headphones shine! 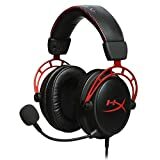 Equipped with 50 mm drivers that deliver a powerful and spacious sound, Dolby Headphone with 7.1 surround sound system, wireless technology that keeps the lag in the imperceptible interval, and battery that can last for up to 16 hours of gameplay, these are the perfect headphones for long gaming sessions! Not to mention that the range for these headphones is about up to 40 feet (12 meters)! Furthermore, the retractable unidirectional digital microphone reduces the environmental noises and increases the clarity of your voice. In terms of design, the frame is easily adjustable and memory foam earpads adapt to any ear shape; even for players wearing glasses. Also, the leatherette covers are perfect for maximum sound isolation and increase the comfort. If you like the idea that louder is better, then the Turtle Beach Recon 200 is the perfect headset! The sound is amplified (due to the 40mm drivers), and they have a feature called Bass Boost which can help the player better immerse themselves in the virtual world. Keep in mind that this headset is optimized for Xbox One (due to Windows Sonic Surround sound, provided by Microsoft) and PS4. Of course, the headset works with other platforms such as Nintendo Switch, PC and mobile. The design is lightweight and attractive. To make them comfortable, durable, and compatible with most head sizes and shapes, Turtle Beach fitted a metal-reinforced headband padded with memory foam and covered in synthetic leather. Furthermore, the earpads are also memory foam, for maximum adaptability. To promote in-game communication, the headphones are fitted with a flip-up mic that’s designed to focus on your voice and not surrounding sounds. Furthermore, you’ll actually hear yourself in the headphones, so you won’t end up shouting every command. As a gamer, you need to be picky when choosing a wireless headset for your gear. The freedom is tempting, but if the headset doesn’t have the right features, you end up losing those split seconds that matter in taking a ground-breaking decision that may influence your entire team’s performance. So, if you don’t want to be the one to drag everybody down, have a look at Arctis 7 from SteelSeries! The headphones use a 2.4G wireless connection to keep the latency in ultra-low settings and without any interferences. Also, the audio quality is immersive due to the S1 speaker drivers which deliver every detail in high-accuracy. Of course, the next-generation DTS Headphone: X v2.0 surround sound system helps at creating a 360-degree layer that gives you precious info on your opponents’ position. The Discord-certified ClearCast mic is considered one of the best in the gaming niche, due to voice clarity and background noise cancellation settings. Finally, the battery life is rather stellar, as you’ll have 24 hours of continuous play at a 12m (40 feet) range. CORSAIR is a legend in the world of gaming, which means they know how to create the perfect accessories. Their focus is set on epic sound and all-day comfort, and the Void PRO headset won’t disappoint! They feature a solid build, impressive design, and utmost comfort delivered through the padded headband and memory foam earcups covered with mesh fabric for increased breathability. Furthermore, the plastic parts are infused with glass fiber for increased durability. The sound quality is also at high standards, using custom-tuned 50mm neodymium speaker drivers to deliver the action right in your room. With a frequency response between 20Hz and 20 kHz, clear sound quality and low latency, there’s no sound that will go unnoticed! 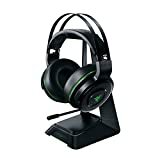 The headset supports a wireless connection that gives the player up to 40 feet in range and about 16 hours of battery life. Also, the unidirectional mic is designed to reduce ambient noise, so your teammates will only hear your voice. 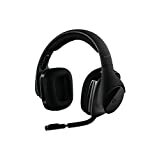 The headset is compatible with the majority of gaming platforms (PC, consoles, and more) and it can be easily updated using the provided software. While the main purpose of sound in games is to immerse the player into the action, nowadays it also has a competitive edge. Developers create specific sound effects (such as steps, whispers, the cocking of a distant gun) to offer subtle clues that could help up your game. However, these cannot be heard with a standard headset! The HyperX Cloud Revolver S is equipped with next-gen 50mm directional drivers to deliver crystal clear sound with lots of oomph and USB Plug N Play Dolby Surround 7.1 technology to create a studio-grade sound stage. This means that you’ll hear all the background sounds developers intended for you to hear, so you’ll be able to pinpoint your enemies’ position even before you have visual contact. Furthermore, the digitally enhanced detachable mic with the noise-canceling feature is perfect for in-game communication (to talk with your teammates). The Cloud Revolver S looks a bit bulky, but the premium leatherette headband is wider than the standard, to better distribute pressure. Also, the entire headset is supported by a steel frame, that adjusts to your unique head shape. Moreover, the signature HyperX memory foam delivers perfect comfort even during long gaming sessions. Overall, the headset is compatible with most consoles (you’ll need an adapter for Xbox One consoles that don’t have a 3.5mm port). You’ll also get a 2m audio control box extension and mic for PCs that works with the onboard sound card. Razer is one of the brands that create gaming accessories thinking about esports athletes. Unlike the regular gamer, top gamers need to travel a lot (to championships), which is why durability is just as important as sound quality. Of course, they also need a headset that can present an accurate sound stage and deliver high levels of comfort. And here’s where the Kraken Pro v2 comes in! These headphones are built using a flexible and durable Bauxite aluminum frame that can be bent and stretched as much as you want without breaking it. Moreover, they are equipped with 50mm neodymium magnets custom tuned drivers for a perfect audio immersion. In terms of comfort, the headphones feature comfortable ear cushions and a padded headband, to avoid any tension during long sessions. The cool thing is, that, even with the padding, the headset doesn’t look extremely bulky. Finally, the Kraken Pro V2 is equipped with a retractable mic that delivers crystal clear communication and there is even an in-line remote, to make controls more accessible. This headset will put you right in the game, with hi-res capable speaker drivers equipped with high-density neodymium magnets that produce up to 40,000 Hz (which is double the frequency response most headphones can reproduce)! Moreover, the premium materials used for the headband and earcups, make your gaming journey a wonderful experience. Also, the overall design is incredibly badass, with a gunmetal finish and aluminum alloy hangers. To communicate with the team, SteelSeries Arctis Pro comes equipped with ClearCast bidirectional retractable microphone that delivers studio-quality voice clarity and cancels most background noises. Now, the headset also comes with a USB ChatMix dial that allows players to adjust chat and game audio on the fly. As an extra touch, the rim around the back of the earcups can change colors, using the available SteelSeries Engine software. Of course, the software has a wider range of options, among which is EQ, mic tone, and more. With a stylish design and gaming-grade wireless features, the Cloud Flight from HyperX feels amazing on your head! The signature HyperX comfort is highlighted by the memory foam ear cushions and the adjustable steel frame that’s both lightweight and durable. The cups swivel at 90 degrees, so you can rest them around your neck when taking a break. Furthermore, the headset is designed to provide immersive audio with crystal clear lows, mids and highs and a wide sound range that lets you know the position of your enemies. The closed cup design and the around-the-ear design of the cup create the perfect sound isolation. Finally, the detachable microphone has noise-canceling features that block surrounding sounds and ensure a crystal-clear communication with the team. Now, if you pair all the features mentioned above, with the 30h battery life and the fact that you can hook this headset up with almost any gaming platform, you get an impressive product that was created to make you a winner! The HS70 is a piece of art when it comes to elegance and comfort! Equipped with plush memory foam around the ears and on the headband, the headset doesn’t feel heavy or tight. Also, the premium materials used for the frame and the back of the cups give it a stylish finish that’s difficult to match in the world of gaming accessories. In terms of audio quality, the precision-tuned 50mm neodymium speaker drivers and the 7.1 surround system manage to create a perfectly-accurate sound stage. 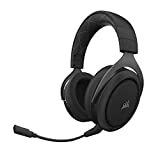 Keep in mind that these are wireless headphones, but they connect via 2.4GHz wireless networks with low-latency, which reduces any lags and gives players a range of about 40ft. Furthermore, the battery will keep going for up to 16 hours of continuous use. Since it’s important to discuss strategy and send call-outs to your teammates, the HS70 is equipped with a removable unidirectional mic that reduces the surrounding noise and focuses on your voice. Also, knowing you’ll need easy access to controls, Corsair placed them on the earcups, so you can adjust anything on the fly. The unique, rugged design makes the A50 from Astro Gaming to stand out from the crowd of gaming accessories. But these are more than just a pretty pair of headphones! The precision boom mic with flip-up-to-mute function gives you the chance to keep in touch with the team and discuss strategy on the go. Next, the 5 GHz wireless connection allows players to break free from cables on a 30ft range, so they won’t be tied to a console or PC. Furthermore, the Astro A50 comes with a charging base station (once the 15h battery life runs out). The headphones are equipped with Dolby digital 7.1 surround sound system for better stage representation. But they are accompanied by the ASTO Studio software that allows players to input their preferences. Finally, the A50 headset has a feature that’s unique to Astro products: game-voice balance. This means you have control over how the voice vs. the gaming sound is represented. When it comes to gaming, there’s nothing more immersive than having a comfortable and high-quality gaming headset to communicate with your teammates and enjoy your game’s sound effects. Whether you’re shopping for the best gaming headset, wireless headphones, earbuds or noise cancelling headphones – it’s always important to consider what has the best features to match your playstyle and personality. TheTechLounge editorial team consists of versatile tech enthusiasts. Each of us specializes in the specific area (from photography to virtual reality). By using this form you agree with the storage and handling of entered data by this website. TheTechLounge is devoted to reviewing tech, software, apps and everything that excites a geeky mind. If your heart starts beating faster with the announce of a new camera, graphics card or game, then you are at the right place. TheTechLounge.com - Copyright © 2019. DISCLAIMER: TheTechLounge generates revenue through a number of affiliate relationships including but not limited to Amazon and Walmart. All names, logos, brands and images are trademarks or copyrighted materials of their respective owners. Amazon and the Amazon logo are trademarks of Amazon.com, Inc. or its affiliates. 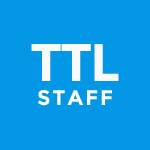 Product prices, ratings and availability that are shown at thetechlounge.com are applicable for Amazon.com Marketplace only! Any prices, ratings and product availability from other Amazon local marketplaces such as Amazon.co.uk, Amazon.de, Amazon.in and others may be different from the ones shown at thetechlounge.com.